Jazz is alive and well in Anchorage, Alaska. It's hard to find live jazz in many major cities, but I have researched many cities in US, and I'd say Anchorage rates in the top three. Only San Francisco and Chicago offer more (by my results). Last night proved the top quality of Anchorage, as the University of Alaska Anchorage presented a Benefit Concert which helps fund upcoming Jazz Week. The Title was "The Music of John Coltrane", and it was led by Rick Zelinsky, a sax artist whom I understand teaches in the local school sytem. He was joined by Pat Owens on trumpet, Dirk Westfall on bass, Evgeny Chernonog, piano, and Cameron Cartland on drums. I usually steer clear of naming names on my blog, but this is an exception, as they are world class, and I would hope that they get recognition in the future. The big Super Bowl weekend is coming up, and stay tuned for the Anchorage Alternative. I'll be reporting on the Women's Cross Country Ski Races on Sunday. The costumes are always great, and they raise a heap for charities. You can believe in global warming if you like, as you did in the 'global cooling' scare of a few years ago, but I'm calling it a natural weather cycle. The lower states are surely suffering more than we in Anchorage, as I note the temperature in Chicago area and north of there are in the minuses now -- that's Fahrenheit, and here we are at PLUS 10 today. But it does seem like winters are long, altho' the daylight in Central Alaska is increasing by 8 minutes a day. The Alaska Magic Circle is preparing for the annual Winter Magic Show on February 9th, which we have been holding at the lovely theatre in the library for the past few years. One of 'our own', Landon Swank, will be flying home to be our guest performer, and it's been a pleasure to watch him grow . . . in size, stature, and professionally. He's attending UNLV now, and actually has an opening gig with Carrot Top in Las Vegas, the mecca for magicians. Free publicity is hard to get, and since we are running a shoe string operation, we are lucky to have the promotion of a magic hobbyist, Bill Tobin, who kindly runs a paragraph online in the Voice of the Times, our former hard copy newspaper. Ah, I see the day when all the newspapers will be online, altho' I still subscribe to our hard copy paper from habit, I guess. Fur Rendezvous is on it's way, but the fill-in period seems to be very busy around here. For an example, take this weekend. There's a heap of things to 'get in' and I personally hope to accomplish some of these. 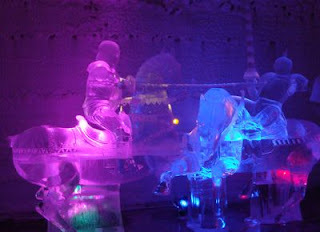 Last night, as you enter the Center for Performing Arts, you can stroll thru Town Square and admire the beautiful ice sculptures that some carvers braced the minus degree weather to carve, and then there was the outstanding Anchorage Symphony Orchestra in the Atwood Theatre (one of 3 in the PAC), with guest conductor, Jung-Ho Pak. He personally came to the pre-concert lecture to rev up the audience, which he repeated by his animated conducting during the Mozart and Beethoven Symphony, but he toned down his dynamics for the moving passionate Dvorak's Cello Concerto, which featured a young woman, Alisa Weilerstein, who could easily challenge Yo Yo Ma's record. After the usual standing ovation, which Anchorage audiences are famous for, I felt that 'we' could have reserved this for a justified performance, such as we heard last evening. But to give you an idea of today's options, after church, you can settle down for the almost last football brunch of the year (yes, Super Bowl is next week) and the University's gymnastics meet, and the Anchorage Aces hockey game in early and late afternoon, respectively. There's more activity then just these things I mention, but I'm a downtown gal, and this is all within a 5 mile range of my condo. So there! Feb. 22 - March 2nd are the dates of Fur "Rondy" . . . the name has been shortened. The later date also butts it up to the Iditarod Sled Dog Race . . . pardon the pun. The new feature this year has also been borrowed from the "Running of the Bulls" in Pampalona. The Alaska version, is the Running of the Reindeer down Fourth Avenue. Just sign up, tie a red scarf around your neck, and show up to run, run. Some of the gals in the Women's Golf Assn. have already done this and practicing for the big event. a. The Rondy World Championship Dog Weight Pull – This puppy power pull began in 1967. Canine athletes compete by hauling weighted sleds to the finish line. b. The Rondy World Championship Sled Dog Races – The World Championship Sled Dog Race debuted in 1946. The 25-mile sprint race rushes through Anchorage and can be viewed at multiple locations throughout the city and local neighborhoods. c. Rondy SnoCross – Intense snowmobiling action revs over double moguls and jumps in this extreme winter sports event. d. Multi Tribal Gathering – This inter-tribal gathering features dance, music and songs of Alaska Native, Native American, Pacific Island and other indigenous cultures of the Western Hemisphere. f. Jim Beam Jam – Rock out with live bands, practice your line dancing, gobble up munchies, and grab a drink with friends at the official Rondy celebration. g. Frostbite Footrace & Costume Fun Run – Don an outrageous costume and run through downtown Anchorage in this family oriented event. The footrace is two laps on a course around downtown. Little runners might chose to participate in the one-lap fun run with mom or dad. One of my earlier blogs referred to the Ice Hotel at Chena Hot Springs, and today I received a notice of a good video showing this great destination, located about 60 miles east of Fairbanks . .. if you want to watch this video, click here. As good as this is, you must see it in person to be totally amazed. The weather in Anchorage has finally toned down . . . seems almost balmy in the 20's. So, there are many outdoor activities to finally take advantage of. The ice sculptures in Town Square top the list, and a stroll thru the square is a great idea, especially after dark, which is most of the time. The Convention and Visitors Bureau held a great Chef's Competition at the Convention Center, in conjunction with a marketing workshop. They had five chefs from some of the top restaurants in town, creating dishes on stage. Then they served samples to the audience, composed mostly of members, but also open to the public. However, it was hard to eat anything at all after the large buffet and mixed drinks, all hosted, earlier. I hope this turns into an annual event. Labels: January is flying by. This is the time of year I get things done. That could be good, or bad, depending on how you look at it. You see, it's just too cold outside to leave my warm, comfy condo unnecessisarily, so I stay indoors, and do my chores. . . It can be quite beautiful to look outside at the snow-laden trees, but it's too cold to snow anymore now, and even the sunshine is cold. How can it be, when the view is so beautiful. Downtown Anchorage has the ice-carving contest going on, and I simply must take a digital shot when I go downtown again. It's so cold, they can't use hot water on the ice for sculpting, or the ice will crack. The results are beautiful, so far. Last night, my girlfriend picked me up in her 'already warmed' car, and we drove by them on the way to a hostel meeting. I wrote this up on my travel blog which I started to promote and give tips and advice on Alaska Travel. The real trick is to get visitors to Alaska year-round, but I hardly blame them for avoiding this zero degree weather. Oh, we do get to a plus 8 during the day, I guess. This is the reason they started a winter event called Fur Rendezvous many years ago. I'll be writing about this on my travel blog pretty soon now. Once you're gone, it's just a nice memory to add to the chain. I can only say that I did all the tourist things. As the song goes, "It was great fun, but it was just one . ... " To condense what could be a long, boring story, I will mention the things I liked most about Tucson. The Arizona Inn has to be at the top of the list. An old, beautiful hotel, untouched by time, with a great restaurant, bar, grounds, etc. The piano player named Bob, or "B-o-o-b" as he preferred to call himself, has been there since 1981, and seen the likes of such celebrities as Frank Sinatra, etc. He invited me to play on the beautiful Steinway Grand, too! Next on my list would be Williams Magic Shop. This couple have had this shop for many years, and accumulated so many good tricks, and friends, which are important - in reverse order. To spend an afternoon there, visiting, buying, coffee-ing, searching, is a delight. Third best was visiting friends in Green Valley (south) and Dove Mountain (north) who told me of several Alaskans who have bought there and retired, or still snow-birding. The unique landscape should be the first priority for the visit, and it is beautiful, but it is being nipped away as in most cities, with 'a shopping center on every corner' . . . let's hope they never wipe out the cacti and tumbleweed. It'll take a long time. 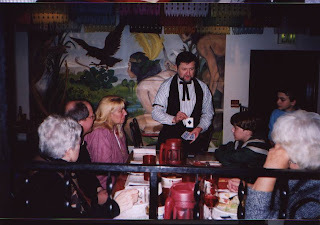 To post this in a timely manner, there are no images, so close your eyes and picture the scene of the old Southwest. Addendum: My friend is blogging a different style from mine, but she's a real pro, so if you want to read her recent blog, click here! The weather has turned so beautiful, I had to log on to eat my words on the negative reporting from my last blog. The University of Arizona has a beautiful planetarium, and it's close to my condo here, too! The program was a Christmas sky, which is a bit passe now, but good viewing nontheless. So many shopping centers, restaurants, art galleries, museums, wild west replicas, and only two days left to cover it all, but the best part has been visiting with old friends who have retired here. Surprising how many Alaskans have moved to the suburbs of Tucson. I'll write a much better travelogue later, but right now I have to absorb more sunshine!